It looks like you need to go to their website to generate an offer code though. And, of course as always, there is small print. 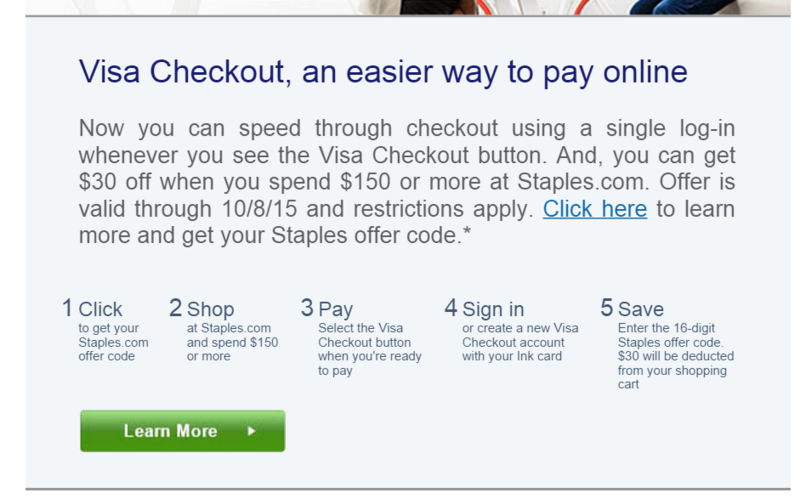 Doesn’t look too crazy to me, but, I haven’t really done much of the Visa Checkout offers. 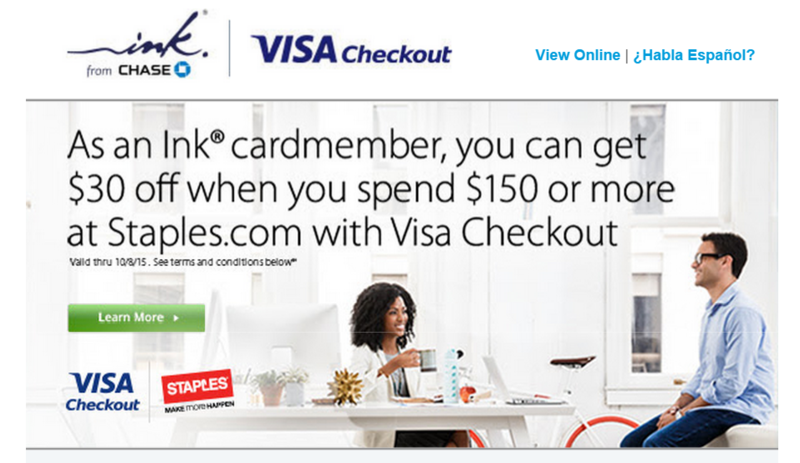 Valid online at staples.com® when you use Visa Checkout, pay with your Ink® credit card and enter the 16-digit Staples offer code. Not valid in store. Limit one offer per customer, nontransferable. Minimum purchase requirement of $150. Tax and shipping not included in calculating the minimum purchase. No cash/credit back. Not valid on any AppleCare® Protection Plans, Beats™, Bose®, Canon® ink, Epson®ink and toner, HP ink and toner, JBL®, Roku®, SquareTrade® warranties, Staples IndustrialSMpurchases, Steelecase®, custom printing orders placed online, services, promotional products, gift cards, prior purchases or any purchases on other provider Web sites. Offer expires 10/8/15 – purchase must be completed by 10/8/15. Chase Bank USA, N.A. is not responsible for offer fulfillment.